I saw their last ever gig in Europe. I was there. It’s not even the one stated on the poster because it was an added date. And although they have this reputation, tapi they just sounded/looked quite dishevelled that night. The only bit which I liked from the concert at the Wembley Arena was the lighting on ‘Tonight, tonight’. That was far out. But if you want lighting, better go see Pink Floyd, kan? Kudo, I do agree that it just doesn’t sound right reviewing gigs in BM. That said, the Indons might make it sound better, though. I went to the same gig as Neon, different nights though. I’m sure he had his reasons, but Billy Corgan techno’d Zero, and looked pretty damned please doing it. 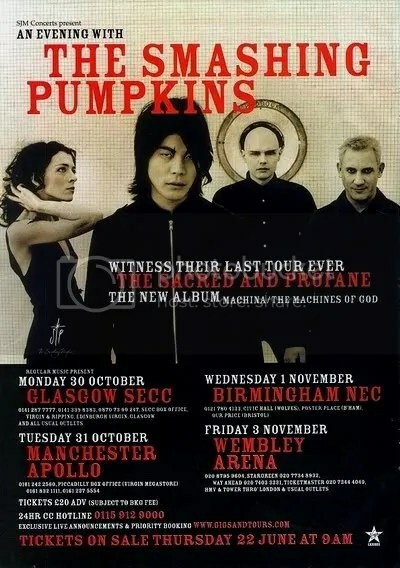 Talk about disappointment- my one and only SP gig, and they techno Zero. It was like Pearl Jam rendering an acoustic version of Brain of J or sth. And yes, rock gig reviews in BM sound weird. “Bingit” = static? feedback? Oh God, just realised the numerous grammatical mistakes I’d made in my last post- Monday morning!